A vine bears three grapes, the first of pleasure, the second of drunkenness, and the third of repentance. The first glass for myself; the second for my friends; the third for good humor; and a fourth for thine enemy. 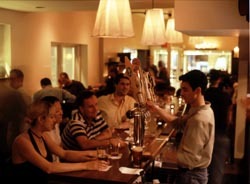 Tria is Philadelphia's bar-cafe that celebrates the fermentation trio of wine, cheese and beer. Tria is the cafe that specializes in the Fermentation Trio of wine, cheese and beer. Wonderful stuff, indeed. Sadly, almost all wines, cheeses and beers sold in the United States are bland, insipid products churned out by scientists in factories. Tria's mission is to bring to you only the good stuff—wines, cheeses and beers crafted by artisans, as in the past, before the Wonder Breadification of our food supply. The difference is in the taste.